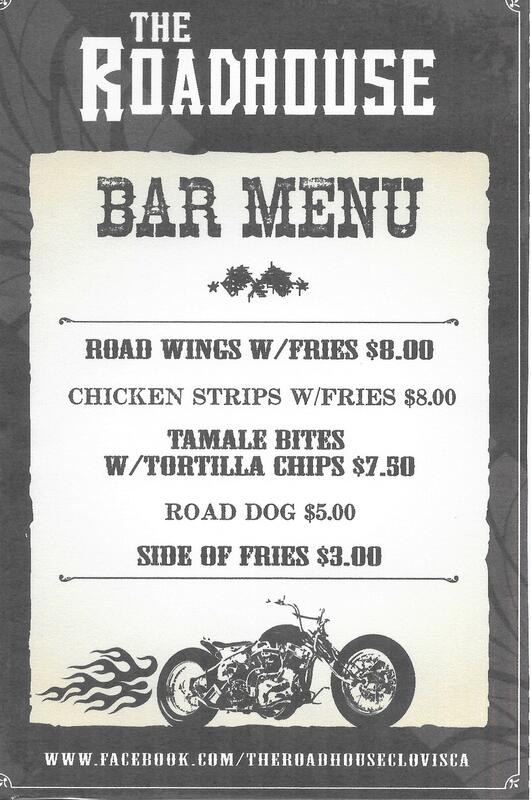 The Roadhouse in Clovis, CA offers you a bar menu that includes road wings with fries. The Roadhouse in Clovis, CA offers you a bar menu that goes perfectly with our frosty beers. We offer our signature Road Wings and Road Dog as well as chicken strips and tamale bites. Everything we serve is simple, tasty and affordable. Join us every Second Saturday of the month for Roadhouse Rumble Bike & Car Show. People’s choice awards, BBQ and Live Music. Every Friday night enjoy the Live DJ/Karaoke of Koyote Productions starting at 8:00 p.m. Check back often so you don’t miss out on the fun. View our gallery for pictures of the bar and past events. Copyright © 2015 The Roadhouse. All rights reserved.